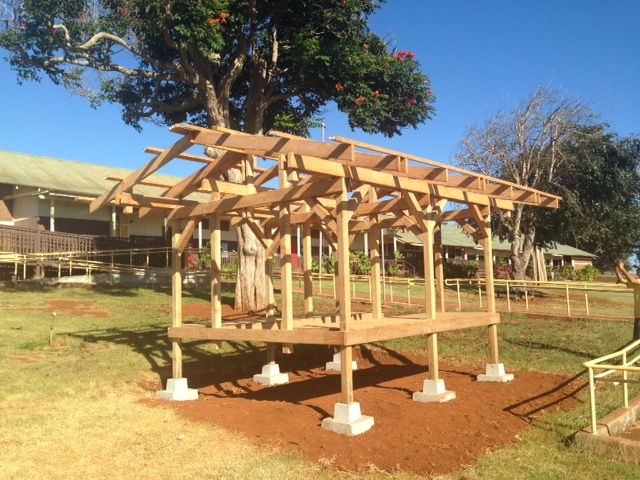 On Thursday, June 26, we completed our latest project at the Maunaloa Elementary School. Back in January, we received a grant from the Kohala Center on Hawaii Island, to construct a brand new greenhouse for the coming school year. We’re so excited to announce that we’ve completed the greenhouse, and can’t wait for students to begin using it in just over a month. The greenhouse will make a tremendous difference for the garden program at Maunaloa, as it will serve as a central hub, and provide a space for students to store and track their plants. Especially exciting is the fact that the greenhouse is situated directly in front of the school, and students will pass it every morning on the walkway up the class. What better way to start the day, then by checking in on all those lettuce starts! “That’s where you put the seeds in!” one student remarked while watching us complete the build. The design of the greenhouse is a Swedish timber and Japanese temple. It was designed, engineered and built by Mathew Goodrich, with the help of FoodCorps service members Simon Mendes and Lacey Phifer.